I, NAMED ABOVE, AS A PARTICIPANT OR AS PARENT OR LEGAL GUARDIAN OF A PARTICIPANT ENROLLED AND PARTICIPATING IN A TRAINING COURSE WITH INTERNET MARTIAL ARTS.COM (aka - IMA), RECOGNIZE THAT THE TRAINING WILL INVOLVE PHYSICAL ACTIVITIES THAT HAVE RISKS AND INJURIES ASSOCIATED WITH PARTICIPATING IN THIS TYPE OF TRAINING PROGRAM; INCLUDING BUT NOT LIMITED TO THOSE OF BODILY INJURY, PARTIAL OR TOTAL DISABLITY, PARALYSIS, AND DEATH OR PERSONAL PROPERTY DAMGE. I, NAMED ABOVE, FOR MYSELF, MY HEIRS, ADMINISTRATORS, EXCUTORS AND ASIGNEES, HEREBY WAIVE, RELEASE, DISCHARGE, COVENANT AND AGREE THAT I WILL NEVER INSTITUTE ANY DEMAND, CLAIM, OR SUIT AGAINST IMA AND /OR THEIR EMPLOYEES, AGENTS, AND VOLUNTEERS FOR BODILY INJURY, PARTIAL OR TOTAL DISABILITY, PARALYSIS, DEATH, OR PERSONAL PROPERTY DAMAGE THAT MIGHT OCCUR FROM ANY CAUSE WHATSOEVER AS A RESULT OF MY PARTICIPATION IN THE ACTIVITIES IN THE IMA PROGRAM. I ACCEPT FULL RESPONSIBILITY FOR THE COST OF TREATMENT FOR ANY INJURY SUFFERED WHILE TAKING PART IN THE IMA PROGRAM. This 4-Month program includes all the fundamentals for earning the Yellow Belt. 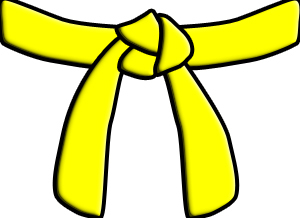 Forms, Basics 1, and Combinations are covered in great detail, taking you every step of the way to successfully completing your first major belt goal: the Yellow Belt! Join today and save $100 off the regular price of $299! The entire four month program and instructor support is just $199, for a limited time! Register today and start on the path to better health and well-being! Copyright © 2014 IMA - All rights reserved.